Minco is a simple utility that integrates closely with iCal and other applications to help you track your time. 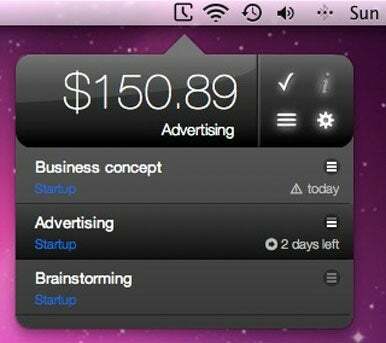 Minco runs as an applet in your Mac’s menu bar. You create, start, and stop tasks right from the applet itself. Minco tracks all tasks in a tasks list and, if you so choose, it will create tasks in iCal for you as well. The latter option is one of many ways in which Minco publishes your data to other Mac programs. Other options include exporting data so that it can be opened in Pages or Numbers, as well as leaving tasks at iChat status messages to tell others you’re busy. These options are disabled by default but can be enabled from Minco’s preferences pane. Starting and editing tasks in Minco is relatively easy. You click your task and Minco begins counting. You click again to pause a task or click the large check mark icon to end a task completely. While adding tasks is easy, ending them is a bit confusing. First, there’s no way to “un-end” a task. If you accidently click the check icon, you have to start a new task with the same name. There’s no way to recall your previous task. Minco treats each task as a separate event. For example, if I track a task and pause at 24:44, and then resume it 10 seconds later, Minco will display 0:10 rather than 24:55. Minco knows I’ve spent a total of 24:55 on the task, but only displays the total time spent on a task in the tasks list. For these reasons, ending tasks seems more cumbersome than it should be. Visually, Minco is sharp looking, even though it mostly hides in your Mac’s menu bar. When clicked, Minco displays an overlay window of the current task. A dropdown tasks list is also available. Adding and choosing tasks from the tasks list is very easy and the entire process runs very smoothly. The only minor quirk I found in testing was that Minco’s task list disappeared at random while it was open. Still, this is a minor issue. Minco stands out from a crowded time tracker field due to its deep integration with iCal and its ability to publish tasks in other programs. It’s a slick utility and a wise choice for anyone seeking a better way to track how time is spent.